AZ01A. Intricate Kazakh Khan (purple) 5n, 5"
Kazakhstan is a country located between Russia and China and aside from Russia was the second largest republic in the former Soviet Union. It is a land rich in history and was the home of Attila the Hun, the Mongols, and later Genghis Kahn. It is the land of camels and the Silk Road. Native Kazakhs, a mix of Turkic and Mongol nomadic tribes who migrated into the region in the 13th century, were rarely united as a single nation. The area was conquered by Russia in the 18th century and Kazakhstan became a Soviet Republic in 1936. During the 1950s and 1960s agricultural "Virgin Lands" program, Soviet citizens were encouraged to help cultivate Kazakhstan's northern pastures. This influx of immigrants (mostly Russians, but also some other deported nationalities) skewed the ethnic mixture and enabled non-Kazakhs to outnumber natives. Independence has caused many of these newcomers to emigrate. 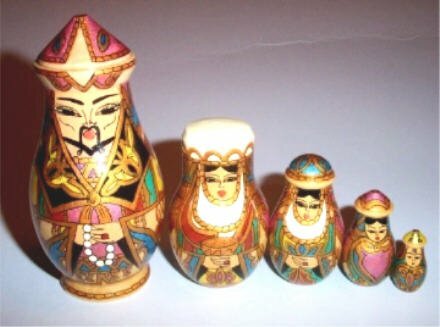 This is a very intricate set of dolls from Kazakhstan. The dolls are dressed in colorful silk robes trimmed in gold using a metallic paint. The robes have detailed patterns in purples, blue, green and rust tones. The hats on this set are quite unique and distinctively shaped. The largest doll has a ridged hat and the dolls have necklaces, rings and jewelry. There is a definite Asian influence in the design of these dolls. The largest doll is signed by the artist in Russian.